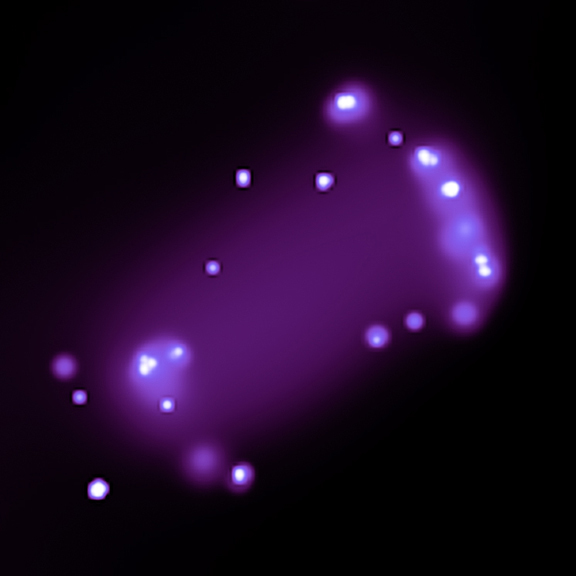 Credit: Composite: NASA/JPL/Caltech/P.Appleton et al. X-ray: NASA/CXC/A.Wolter & G.Trinchieri et al. This image combines data from four different observatories: the Chandra X-ray Observatory (purple); the Galaxy Evolution Explorer satellite (ultraviolet/blue); the Hubble Space Telescope (visible/green); the Spitzer Space Telescope (infrared/red). 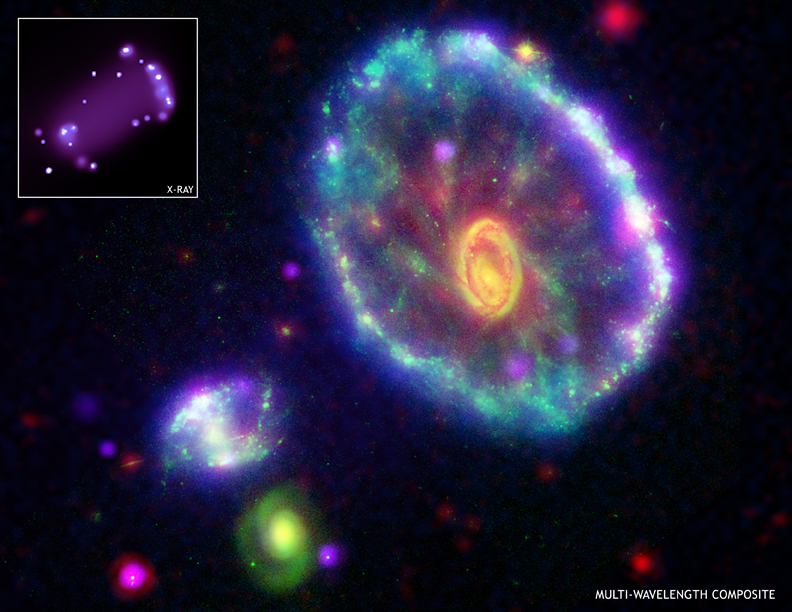 The unusual shape of the Cartwheel Galaxy is likely due to a collision with one of the smaller galaxies on the lower left several hundred million years ago. The smaller galaxy produced compression waves in the gas of the Cartwheel as it plunged through it. These compression waves trigger bursts of star formation. The most recent star burst has lit up the Cartwheel's rim, which has a diameter larger than that of the Milky Way galaxy, with millions of bright young stars. When the most massive of these stars explode as supernovas, they leave behind neutron stars and black holes. Some of these neutron stars and black holes have nearby companion stars, and have become powerful sources of X-rays as they pull matter off their companions. The brightest X-ray sources are likely black holes with companion stars, and appear as the white dots that lie along the rim of the X-ray image. The Cartwheel contains an exceptionally large number of these black hole binary X-ray sources, because many massive stars formed in the rim. Credit Composite: NASA/JPL/Caltech/P.Appleton et al. X-ray: NASA/CXC/A.Wolter & G.Trinchieri et al. Coordinates (J2000) RA 0h 37m 41.10s | Dec -33º 42' 58.80"
Orientation North to the right, East is up.